Starfish, also known as sea stars, are under attack up and down the US Pacific coastline. The perpetrator isn't a predator, but a mysterious and grisly disease known as sea star wasting syndrome that is ripping them apart from the inside. Here's what you need to know – and what you can do to help. 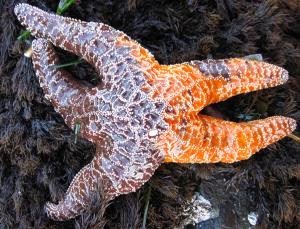 What is sea star wasting syndrome? It is the name for the mysterious illness that riddles starfish with ulcers and causes their arms to twist and even "crawl" away from their bodies until they tear off. It leaves their innards behind in a mush. Hundreds of thousands of stars, if not more, have already perished from the syndrome since divers and aquarium-goers on the US west coast spotted the disease last June.